The MasterCard Foundation Scholars Program (MCFSP) targets academically qualified, yet economically disadvantaged young people in South Africa, SADC and the rest of Africa, who have the desire to contribute to the transformation of the African continent. The MasterCard Foundation Scholars Program identifies bright young people who have demonstrated a commitment to making a difference in their communities, yet face significant barriers to accessing and completing quality education. The MCFSP provides a comprehensive scholarship, mentoring and counseling, academic support and access to work readiness skills. Community service is a necessary component of this program. All the students are expected to return to their home countries and ‘give back’ to disadvantaged communities. The University Of Pretoria (UP), a leading research-intensive university in Africa, hosts this scholarship. More than 60,000 currently registered students from Africa and further afield enroll at UP each year. The University has nine faculties, including the Faculty of Veterinary Science on the Onderstepoort Campus, which is the only one of its kind in South Africa. Master’s degree applicants in the fields mentioned above may also apply for the scholarship. Honors candidates may also be considered for the scholarships if they are ready to commit to continuing to a Master’s degree. In 2014, the University of Pretoria collaborated with The MasterCard Foundation Scholars Program to provide bursaries to 347 students over the following ten years. Two-thirds of these bursaries are for postgraduate study while one-third is for undergraduate study. Economically disadvantaged young people inSouth Africa, SADC and the rest of Africa. Applicants should come from economically disadvantaged backgrounds, and provide evidence of financial need. Each candidate should demonstrate leadership potential and should be involved in a giving back project in their community, school or church. Students must be ready to maintain high academic standards for the duration of the scholarship. Candidates should be first time applicants (first-year students) in the degree program of choice. Applicants for Undergraduate courses must have admission to study in the fields of Engineering, Agricultural Sciences/Economics, Information Technology or Informatics. Postgraduate applicants must have admission to study in the fields of Engineering, Agricultural Sciences or Commerce. Application to the faculty of choice should be done before applying for the MasterCard Scholars Program. 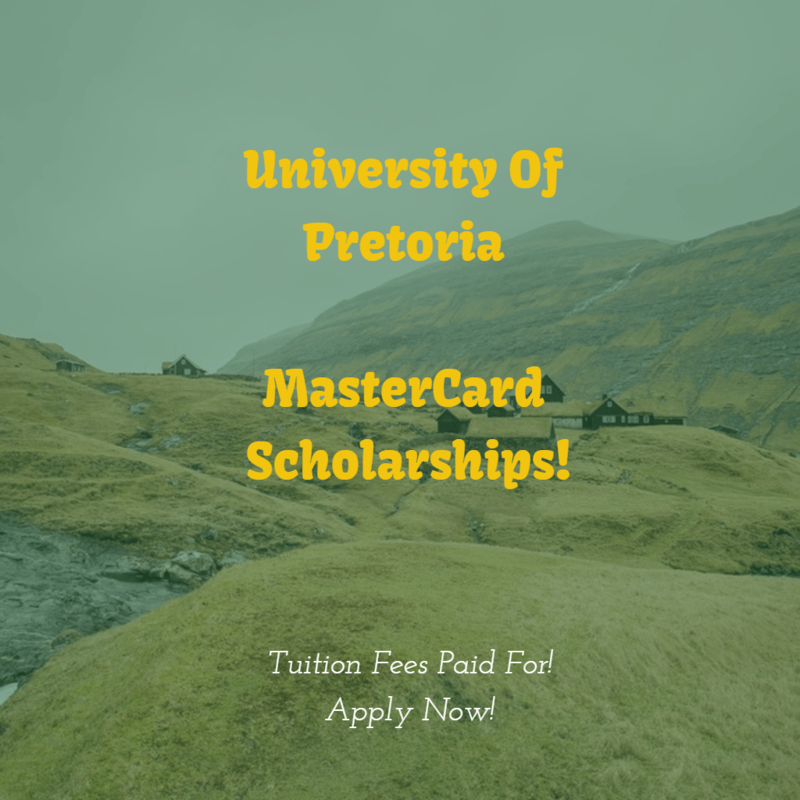 To apply for The MasterCard Foundation Scholars Program at the University of Pretoria, you MUST have been admitted to UP and had the required supporting material sent to the University. You will need your student number to complete The MasterCard Foundation Scholars Program application form. Be sure to include documents that support what your family, guardian, or foster parents can afford to pay. Examples of this documentation include bank statements, pay slips and loan documents. Only students admitted to full-time study programs at the University of Pretoria will be considered for the MCFSP. The Program only applies to students who cannot afford to pay the full fees. Do not apply for funding if you or your parents, guardian or foster parents can afford the full fees. All the information provided must be accurate and true. Any falsification of information on this application may result in your admission to the University being withdrawn. Students who are interested in studies at the University of Pretoria and wish to apply for The MasterCard Foundation Scholars Program must follow the application process. Apply online at up.ac.za/apply. Alternatively, you can submit a hard copy of your application form. For more information, dial +27 (0)12 420 3111 or send an email to csc@up.ac.za. After your application has been submitted, members of the relevant faculty will evaluate it. The faculty members will inform you whether you have been admitted. Once you have been provisionally admitted, please contact mcfsp@up.ac.za to commence the process to apply for The MasterCard Foundation Scholars Program immediately. Email the application as an attachment (word document or scanned copy). If submitting a handwritten scholarship application, ensure that all required documents are legible. Postgraduate applicants should send their MCFSP applications to vumazonke@up.ac.za. Make sure that your application contains all the supporting documents. For more information, email the above addresses, or call +27 (0) 12 420 4297/6621. Note that all applicants should have a valid passport to enable them to apply for a visa promptly. Applications for The MasterCard Foundation Scholars Program at UP open on 1 May 2017, and close on 15 September 2017. To learn more about The MasterCard Foundation Scholars Program, visit mastercardfdnscholars.org. To learn more about The MasterCard Foundation, visit mastercardfdn.org. Please study the ISD Newcomer’s Guide for general information for international students.